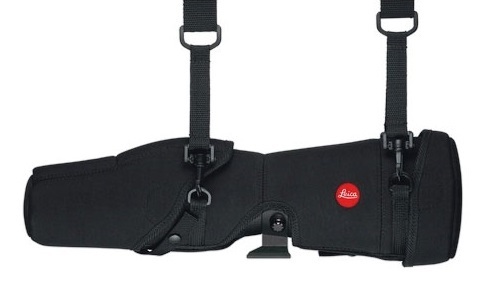 Leica's "Ever Ready Case" is a wonderful accessory that provides added protection for your new Leica APO Televid 82 straight spotting scope. The scope is fully functional with flip down lens covers, tripod access and an open focus knob areas. The eyepiece cover is held on with sewn in magnets. The case also has a shoulder strap that attaches on in four separate places (two on each side of the barrel).